Year end is around the corner but brand new Korean dramas with unique story and interesting characters keep on coming out. Here we introduce the scenes taken in Gangwon and great shooting locations making story more fantastic. Of course, there are great tourist spots nearby the shooting location too! Jumunjin Beach (주문진 해수욕장) is located in the northern-most part of Gangneung, and is a great place for family vacations due to the beach’s shallow water. The flat bottom and clear water make it easy to gather clams and to fish at the nearby lake. 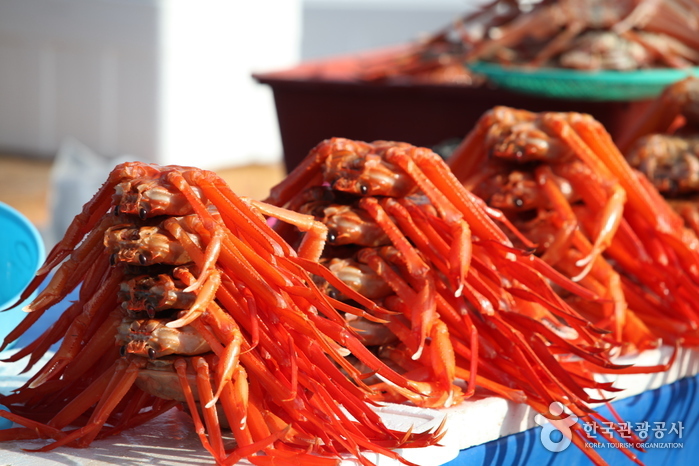 You can also easily purchase low-priced, fresh seafood because of its proximity to Jumunjin Harbor. 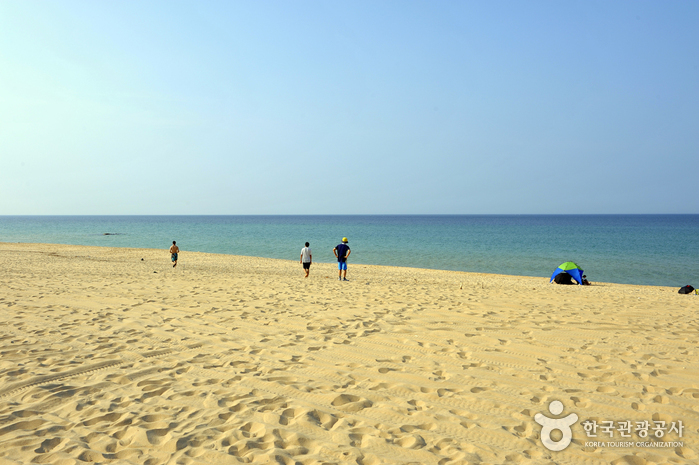 Jumunjin Beach is a medium-sized beach characterized by fine sand and unusually blue water. Many dark colored rocks and stones are visible as well, which are interesting sites for tourists visiting the beach. The fine view of pine trees behind the white sands only accentuates its beauty. Romantic Gangneung is a city of coffee. Don’t forget to try hand-drip coffee and squid-shaped bun (it contains sweet red bean together with squid powder and real squid meat! Surprisingly it tastes so good :)!) in Gangneung. 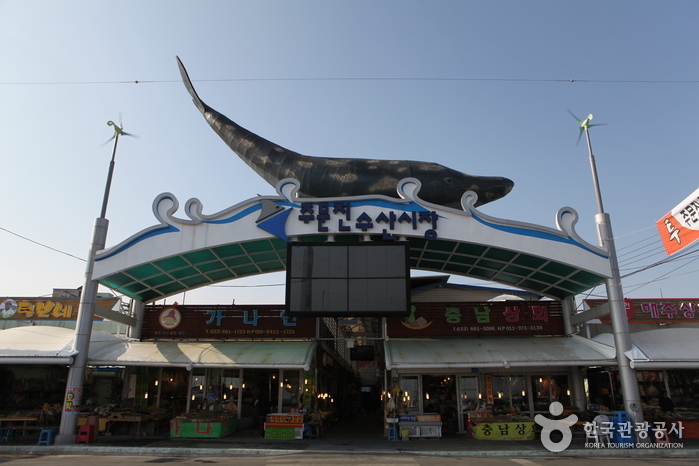 For more details about Gangneung, click the posting about Gangneung city! This romantic ski scene was taken in Daemyung Vivaldi Park which is a leisure complex having water themed park, golf club and horse riding club as well. Along with a good accessibility from Seoul area, many visitors continuously find Daemyung Vivaldi Park. And did you know it’s only 1.5 hours away from Seoul and you can have a FREE shuttle service from Seoul? Click HERE to go to FREE shuttle reservation page, you may make a day trip to enjoy the skiing time and great facilities! Ski festival titled VIVA SKI FESTIVAL is a collaboration of Korea Tourism Organization, Gangwon province and Daemyung Vivaldi Park. Uniquely Viva K-Food festival is a combination of ski training and Korean food experience. In this festival, you can learn skiing as well as attend Korean food cooking class. And of course, you will have a chance to try the street food styled snack as Tteokbokki and others also 🙂 Please click the banner to find more details. For who is looking for HOT vs COLD experience in this Winter season, come join the contest by Daemyung Vivaldi Park to win away the prize! (Please note that the contest is only available for Malaysian nationality holder. *) Please click the banner to be linked to contest page.